A group of internal auditors in the public sector from different countries in Eastern Europe and Central Asia were having their 34th official meeting. For seven years now they had been coming together to hear how others in the region were engaged in internal audit and to create manuals and other publications that they felt were missing from their profession. Only a few of the original members were still part of the group, but the shared work, stories, and artifacts created over time gave their meetings a sense of continuity and purpose. If you were a fly-on-the wall at one of their events you would notice how new members were warmly welcomed into “the family”, how many people stepped up to take initiative or share their war stories, and how ambitious core members were to advance the practice of internal audit in the public sector in the region. Evening events, organized by the host country, were always lively – with singing, dancing and a hymn composed and sung by members. The term “community of practice” is of relatively recent coinage, even though the phenomenon it refers to is age-old. The concept has turned out to provide a useful perspective on knowing and learning. A growing number of people and organizations in various sectors are now focusing on communities of practice as a key to improving their performance. This brief and general introduction examines what communities of practice are and why researchers and practitioners in so many different contexts find them useful as an approach to knowing and learning. The domain: A community of practice is not merely a club of friends or a network of connections between people. It has an identity defined by a shared domain of interest. Membership therefore implies a commitment to the domain, and therefore a shared competence that distinguishes members from other people. (You could belong to the same network as someone and never know it.) The domain is not necessarily something recognized as “expertise” outside the community. A youth gang may have developed all sorts of ways of dealing with their domain: surviving on the street and maintaining some kind of identity they can live with. They value their collective competence and learn from each other, even though few people outside the group may value or even recognize their expertise. The community: In pursuing their interest in their domain, members engage in joint activities and discussions, help each other, and share information. They build relationships that enable them to learn from each other; they care about their standing with each other. A website in itself is not a community of practice. Having the same job or the same title does not make for a community of practice unless members interact and learn together. The claims processors in a large insurance company or students in American high schools may have much in common, yet unless they interact and learn together, they do not form a community of practice. But members of a community of practice do not necessarily work together on a daily basis. The Impressionists, for instance, used to meet in cafes and studios to discuss the style of painting they were inventing together. These interactions were essential to making them a community of practice even though they often painted alone. The practice: A community of practice is not merely a community of interest–people who like certain kinds of movies, for instance. Members of a community of practice are practitioners. They develop a shared repertoire of resources: experiences, stories, tools, ways of addressing recurring problems—in short a shared practice. This takes time and sustained interaction. A good conversation with a stranger on an airplane may give you all sorts of interesting insights, but it does not in itself make for a community of practice. The development of a shared practice may be more or less self-conscious. The “windshield wipers” engineers at an auto manufacturer make a concerted effort to collect and document the tricks and lessons they have learned into a knowledge base. By contrast, nurses who meet regularly for lunch in a hospital cafeteria may not realize that their lunch discussions are one of their main sources of knowledge about how to care for patients. Still, in the course of all these conversations, they have developed a set of stories and cases that have become a shared repertoire for their practice. What do communities of practice look like? Communities of practice are not called that in all organizations. They are known under various names, such as learning networks, thematic groups, or tech clubs. While they all have the three elements of a domain, a community, and a practice, they come in a variety of forms. Some are quite small; some are very large, often with a core group and many peripheral members. Some are local and some cover the globe. Some meet mainly face-to-face, some mostly online. Some are within an organization and some include members from various organizations. Some are formally recognized, often supported with a budget; and some are completely informal and even invisible. Communities of practice have been around for as long as human beings have learned together. At home, at work, at school, in our hobbies, we all belong to communities of practice, a number of them usually. In some we are core members. In many we are merely peripheral. And we travel through numerous communities over the course of our lives. Social scientists have used versions of the concept of community of practice for a variety of analytical purposes, but the origin and primary use of the concept has been in learning theory. Anthropologist Jean Lave and Etienne Wenger coined the term while studying apprenticeship as a learning model. People usually think of apprenticeship as a relationship between a student and a master, but studies of apprenticeship reveal a more complex set of social relationships through which learning takes place mostly with journeymen and more advanced apprentices. The term community of practice was coined to refer to the community that acts as a living curriculum for the apprentice. Once the concept was articulated, we started to see these communities everywhere, even when no formal apprenticeship system existed. And of course, learning in a community of practice is not limited to novices. The practice of a community is dynamic and involves learning on the part of everyone. Where is the concept being applied? The concept of community of practice has found a number of practical applications in business, organizational design, government, education, professional associations, development projects, and civic life. Communities of practice enable practitioners to take collective responsibility for managing the knowledge they need, recognizing that, given the proper structure, they are in the best position to do this. Communities among practitioners create a direct link between learning and performance, because the same people participate in communities of practice and in teams and business units. Practitioners can address the tacit and dynamic aspects of knowledge creation and sharing, as well as the more explicit aspects. Communities are not limited by formal structures: they create connections among people across organizational and geographic boundaries. From this perspective, the knowledge of an organization lives in a constellation of communities of practice each taking care of a specific aspect of the competence that the organization needs. However, the very characteristics that make communities of practice a good fit for stewarding knowledge—autonomy, practitioner-orientation, informality, crossing boundaries—are also characteristics that make them a challenge for traditional hierarchical organizations. How this challenge is going to affect these organizations remains to be seen. Government. Like businesses, government organizations face knowledge challenges of increasing complexity and scale. They have adopted communities of practice for much the same reasons, though the formality of the bureaucracy can come in the way of open knowledge sharing. Beyond internal communities, there are typical government problems such as education, health, and security that require coordination and knowledge sharing across levels of government. There also, communities of practice hold the promise of enabling connections among people across formal structures. And there also, there are substantial organizational issues to overcome. Internally: How to organize educational experiences that ground school learning in practice through participation in communities around subject matters? Externally: How to connect the experience of students to actual practice through peripheral forms of participation in broader communities beyond the walls of the school? Over the lifetime of students: How to serve the lifelong learning needs of students by organizing communities of practice focused on topics of continuing interest to students beyond the initial schooling period? From this perspective, the school is not the privileged locus of learning. It is not a self-contained, closed world in which students acquire knowledge to be applied outside, but a part of a broader learning system. The class is not the primary learning event. It is life itself that is the main learning event. Schools, classrooms, and training sessions still have a role to play in this vision, but they have to be in the service of the learning that happens in the world. Associations. A growing number of associations, professional and otherwise, are seeking ways to focus on learning through reflection on practice. Their members are restless and their allegiance is fragile. They need to offer high-value learning activities. The peer-to-peer learning activities typical of communities of practice offer a complementary alternative to more traditional course offerings and publications. Social sector. In the civic domain, there is an emergent interest in building communities among practitioners. In the non-profit world, for instance, foundations are recognizing that philanthropy needs to focus on learning systems in order to fully leverage funded projects. But practitioners are seeking peer-to-peer connections and learning opportunities with or without the support of institutions. This includes regional economic development, with intra-regional communities on various domains, as well as inter-regional learning with communities gathering practitioners from various regions. International development. There is increasing recognition that the challenge of developing nations is as much a knowledge as a financial challenge. A number of people believe that a communities-of-practice approach can provide a new paradigm for development work. It emphasizes knowledge building among practitioners. Some development agencies now see their role as conveners of such communities, rather than as providers of knowledge. The web. New technologies such as the Internet have extended the reach of our interactions beyond the geographical limitations of traditional communities, but the increase in flow of information does not obviate the need for community. In fact, it expands the possibilities for community and calls for new kinds of communities based on shared practice. The concept of community of practice is influencing theory and practice in many domains. From humble beginnings in apprenticeship studies, the concept was grabbed by businesses interested in knowledge management and has progressively found its way into other sectors. It has now become the foundation of a perspective on knowing and learning that informs efforts to create learning systems in various sectors and at various levels of scale, from local communities, to single organizations, partnerships, cities, regions, and the entire world. The diversity of types of communities across different sectors has shown that there is no one-recipe-fits-all, despite some of the claims that are made about them. Here are some of the assertions or “myths” that have won some acclaim, in part due to the interpretation of early theoretical writing about them. False. Some communities do self-organize and are very effective. But most communities need some cultivation to be sure that members get high value for their time. Mostly false. In many communities of practice decisions need to be taken, conditions need to be put in place, strategic conversations need to be had. Not all members see value in being involved in these processes. Whether you call them leaders, co-ordinators, or stewards, someone needs to do it – and it is as well to recognize them for the role they play. False. There are many informal communities of practice. And there are many formal ones too. The more intentionally they are used for developing the strategic capability of an organization or a cause, the more likely they are to have to go through some formal process to be recognized as such. Partially true. The experience people have to share is clearly important. But communities of practice also innovate and solve problems. They invent new practices, create new knowledge, define new territory, and develop a collective and strategic voice. Mostly false. It may be difficult to attribute with 100% certainty the activities of a community of practice to a particular outcome. You can, howowever, build a good case using quantitative and qualitative data to measure different types of value created by the community and trace how members are changing their practice and improving performance as a result. False. Artful faciliation is very important. But there are many other reasons why people may not participate. The domain must be relevant and a priority to members. The value of participation usually needs to be recognized by the organization otherwise members will not bother. Members need to see results of their participation and have a sense that they are getting something out of it. Good facilitation can help to make this visible, but is not the main reason why people participate. Maybe. But if they are totally conflict free, you should be concerned that groupthink may be settling in or voices being silenced. More important, and usually quite difficult to achieve, is that differences are discussable and that they contribute to the learning. False. There may be, but we haven’t found it yet. The online universe is cluttered with spaces that nobody uses. It’s also full of sites that are called a community of practice even if no one is there! A tool or technology is as good as it is useful to the people who use it. And a forum is simply a forum until it becomes occupied by a community of practice. Communities of practice are the solution to everything! False. Communities of practice don’t substitute teams or networks or other joint enterprises. Each has its own place in the overall ecology of the learning system. 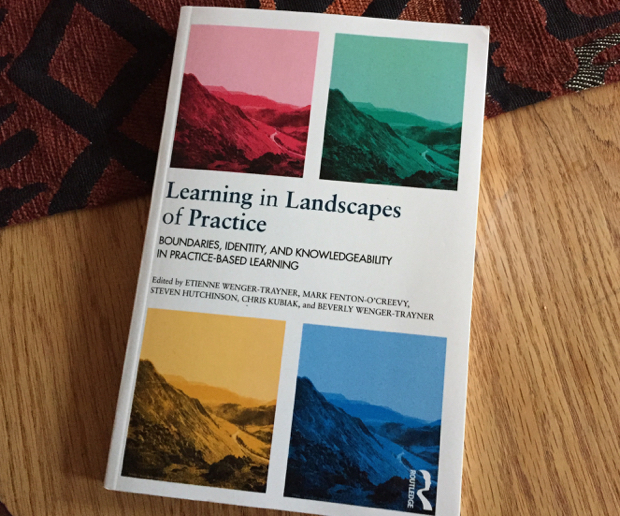 In recent developments of the theory we talk about landscapes of practice, and of creating different types of social learning spaces that open up new opportunities for developing learning capability. Communities of practice: learning, meaning, and identity. By Etienne Wenger, Cambridge University Press, 1998. Small and project-driven. Face-to-face or online.